Over the past 30 years, Egan's THE SKILLED HELPER has taught thousands of students like you a proven, step-by-step counseling process that leads to increased confidence and competence. 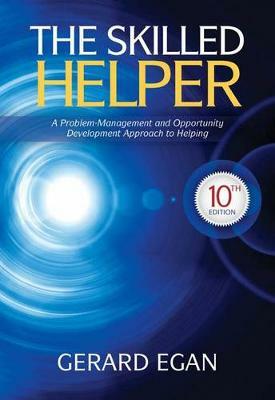 Internationally recognized for its successful problem-management and opportunity development approach to effective helping, the text emphasizes the collaborative nature of the therapist-client relationship and uses a practical, three-stage model that drives client problem-managing and opportunity-developing action. As you read, you'll also gain a feeling for the complexity inherent in any helping relationship. In this tenth edition, Egan now makes use of his version of the "common factors" approach, which gives new meaning and vitality to the book's themes, as well as to the use of the problem-management model to organize and give coherence to those themes.